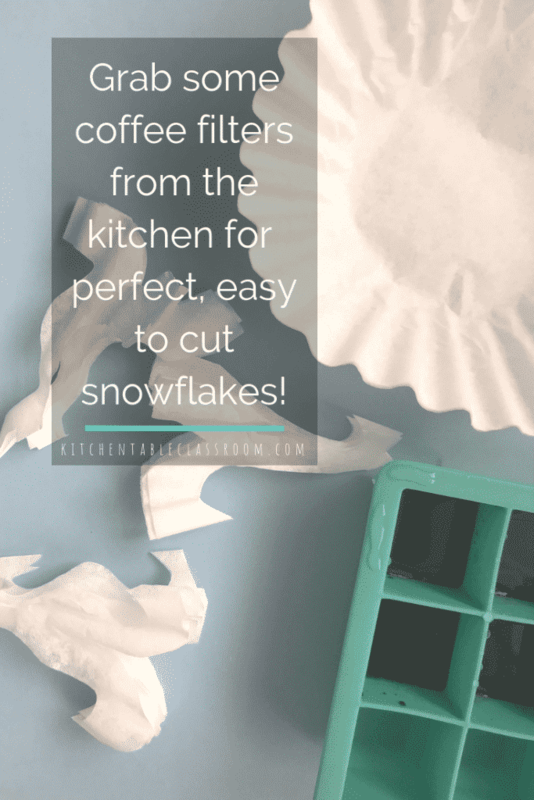 This coffee filter snowflake project is perfect for the winter season. While Santa Claus and Christmas trees are only appropriate in December these snowflakes celebrate the beauty of the entire winter season! 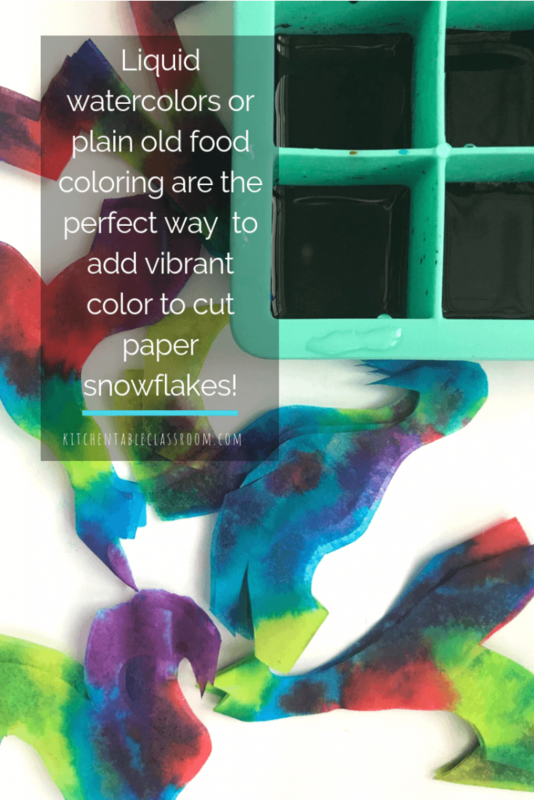 Coffee filters plus watercolors paints or even plain old food coloring will get you started! 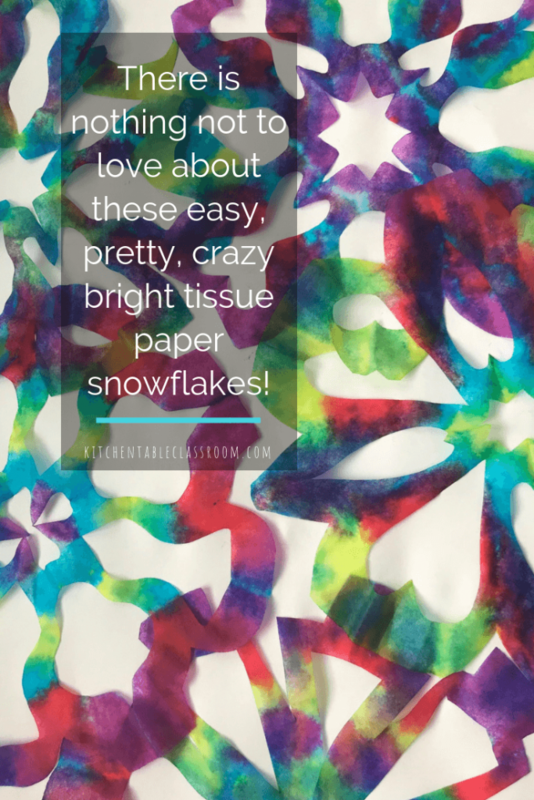 The only materials you need to make these vibrant watercolor snowflakes are white coffee filters (the round ones, not the cone shaped kind), scissors, and watercolor paints. We used these concentrated liquid watercolor paints by Sax. They are so vivid and have many applications in these tiny bottles. Crayola watercolors (the dry cake kind) like will work just fine if that’s what you have! Update – this also works beautifully using liquid food coloring that have been slightly diluted! I think making snowflakes is one of those things that everyone has fun memories of as a kid. I remember mass producing paper snowflakes from white copy paper and taping them to windows. The reason I love making snowflakes with coffee filters instead of paper is because they are SO easy to cut. Cutting through many layers of paper can get tough for little hands. Coffee filters are thin so it’s easier for little hands to cut through multiple layers, and get more intricate designs! If you’re working with really young kids folding the coffee filter into fourths is a good place to start! If your students are a bit older and have better scissor skills fold the coffee filter into eighths for more intricate designs. Demonstrate to kids how to cut snips and pieces out of each folded triangle without cutting so much it falls apart. If kids haven’t made snowflakes before start with just cutting triangles out of each side of the triangle. The snowflake will stay intact and they can get fancier with each try! I show my kids how to fold them and them cut them loose to experiment. These things are so inexpensive they can go through lots figuring out the cutting method that gets the result they like the most! These coffee filters are a great place to try using liquid watercolors. These paints come in teeny tiny bottles of super concentrated color. Because they are so concentrated you only need a bit of paint diluted in water so they last forever! 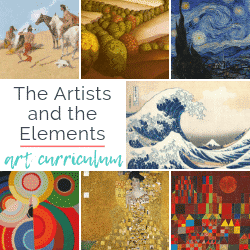 Check out this post on watercolor techniques for lots of other places to use those liquid watercolors should you choose to invest in them! If you don’t have liquid watercolors substitute liquid food coloring from your pantry. It will totally work. I like to set these paints up in an in a silicone ice cube tray that we reserve for artsy purposes. 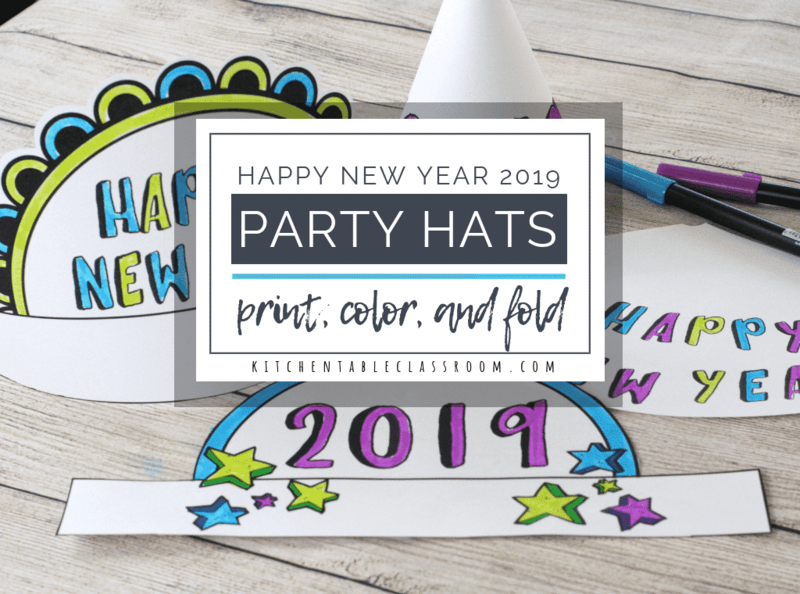 This set comes with lids so you can save your leftover paint for another day! Score! There’s a lot of wiggle room for how much watercolor paint to add to the water. More paint equals more vibrant color. Less paint will create a lighter, more pastel palette. 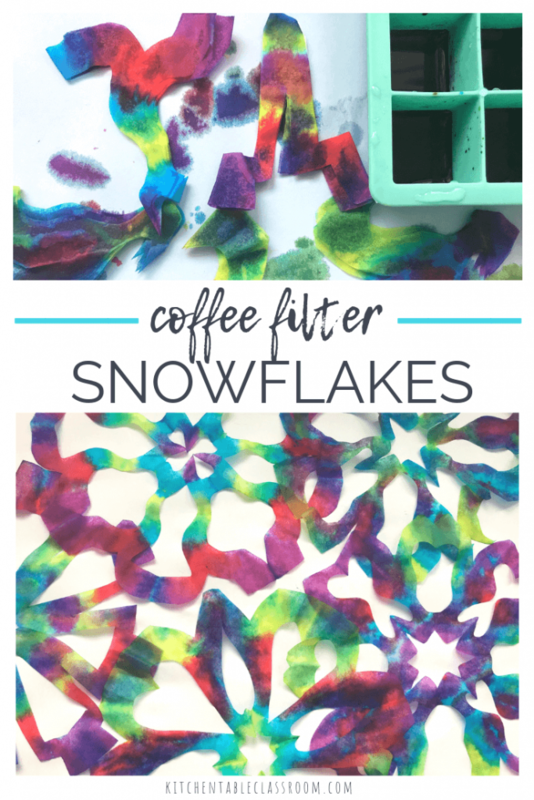 This process will be more effective if your little artist keeps the coffee filter snowflake folded. Of course they can still be painted when they are flat. So if your little rebel opens ’em up it’s no big deal.We did figure out that those little boogers are near impossible to fold back up after being opened to check them out! Dip corners and sides of each folded coffee filter into the liquid watercolor. 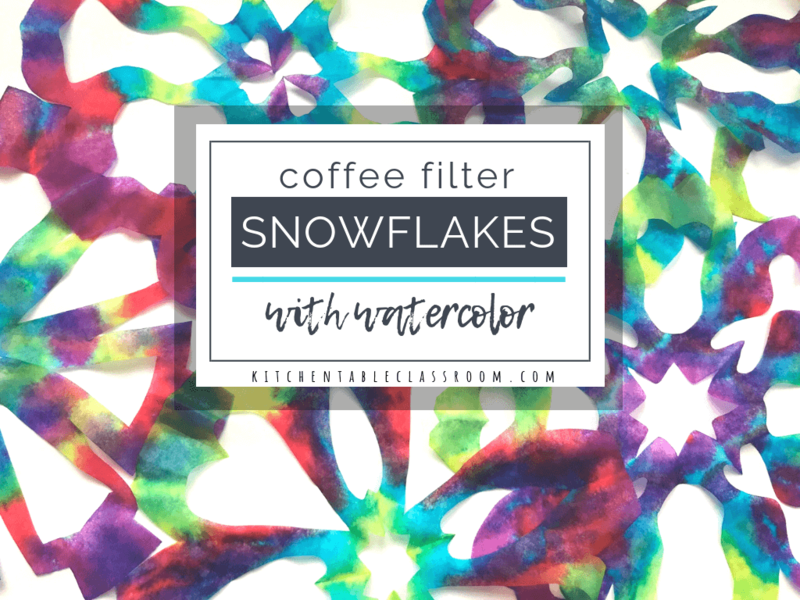 Because the coffee filter snowflakes are so absorbent the color will spread. It’s a but mesmerizing to watch the color move and mix with the other colors as they meet and mix. Because the coffee filters are so thin they are fragile when wet. After painting lay the coffee filter snowflakes aside and go build a snowman. Seriously… resist the temptation to open them up. They will tear. While you have the coffee filters out check out this post with 9 more easy things to make with coffee filters! 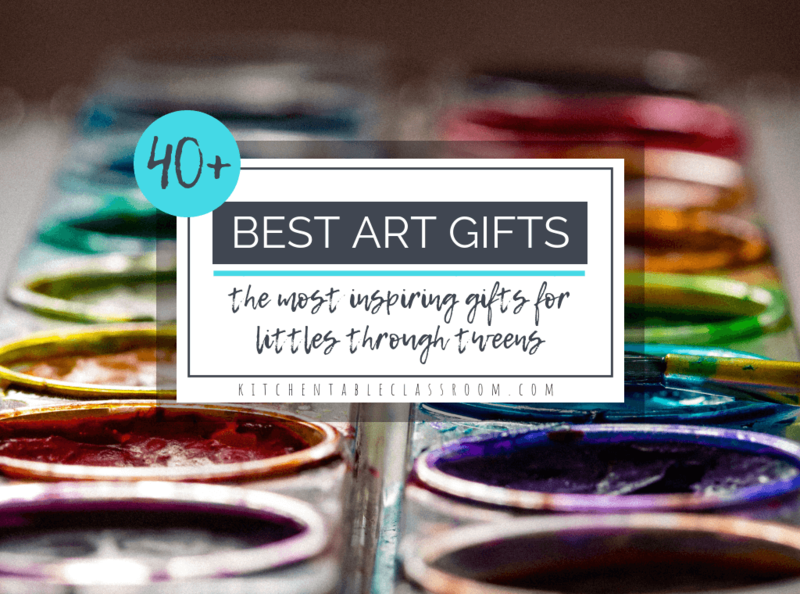 These things are cheap and versatile- perfect for crafting with kids! That’s it! You’re done! Allow them to dry, open carefully, and then hang them up and enjoy! If you enjoyed this watercolor snowflake project please share it on your favorite social media channel! 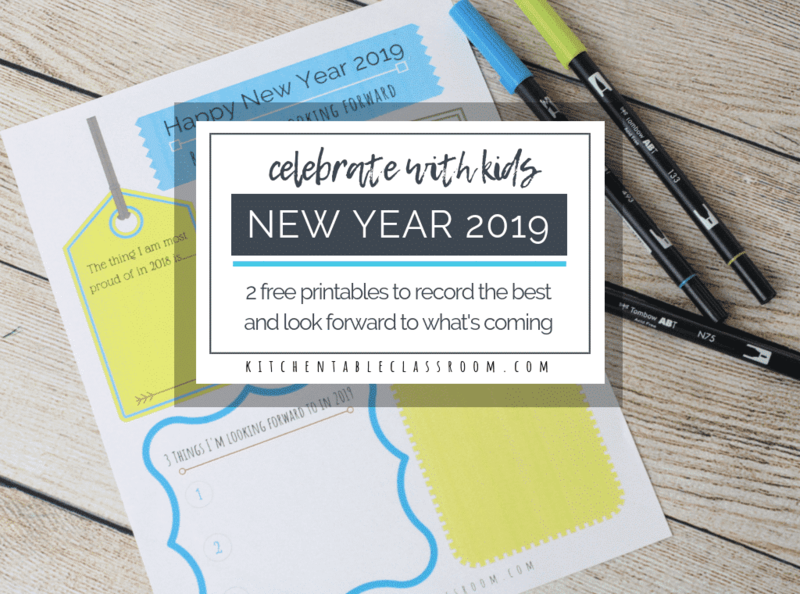 Every single share helps me to grow the Kitchen Table Classroom and bring you more free printables and fun projects! Fun ideas.. We made snowflakes from coffee filters one year and then used shaving cream and food coloring to marble them. These remind me of those but with a larger variety of color. Oh how neat! I have done both processes (shaving cream and food coloring is currently in my co-op tote) but never though of combining them! Thanks for the great suggestion! Thanks Jen! My people liked it too!! Oh, we love coffee filter art ideas. Thanks for sharing! Projects that don’t have a lengthy supply list are the best, aren’t they? Although I really love ordering new supplies too! Haha. Thanks for stopping by! 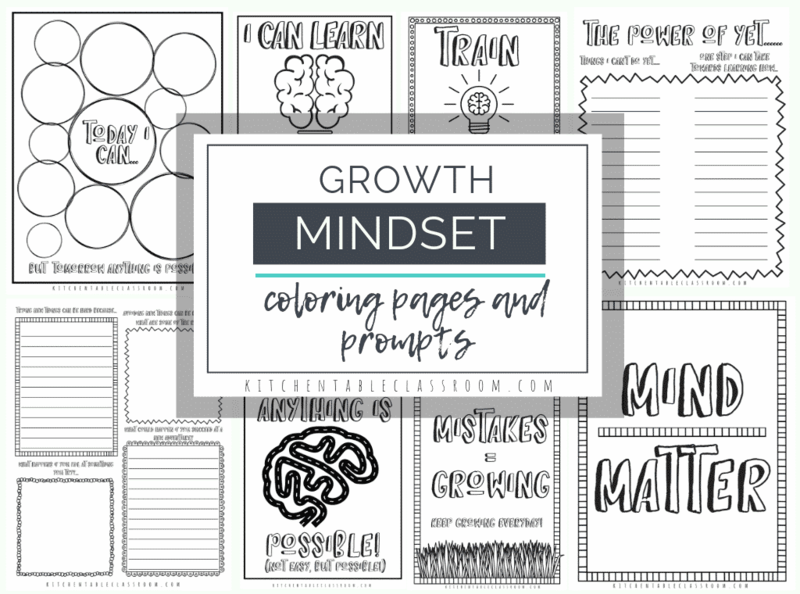 This is a lovely winter activity, with results that are displayable! Love that you added color. 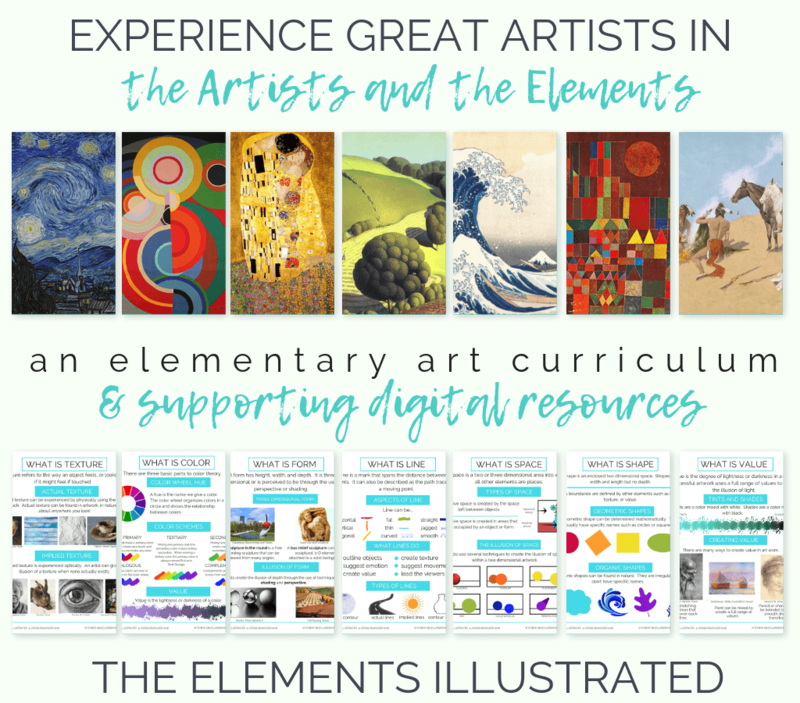 I love art, literature, science connections, too! And also have a snowflake blog post. 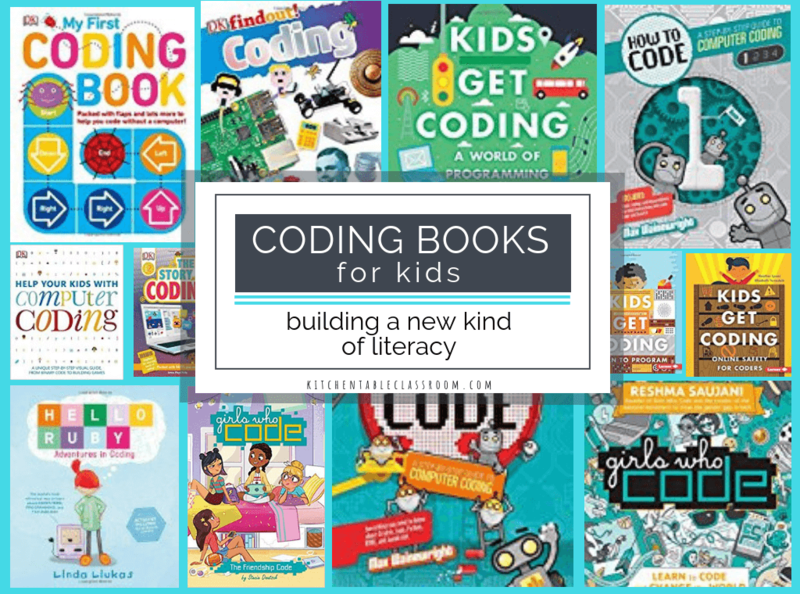 We found different children’s lit, now I can add to our list. Thanks. Thanks for stopping by Angie! Let me know how it goes for you!